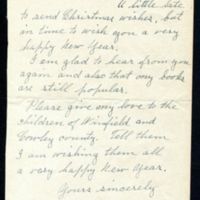 Christmas card expressing good wishes, including love to children of Winfield and Cowley county. 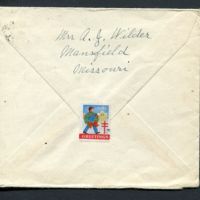 The copyright in Laura Ingalls Wilder’s correspondence is owned and controlled by Little House Heritage Trust, and may not be reproduced or otherwise copied or used without the Trust’s written permission. All rights reserved. 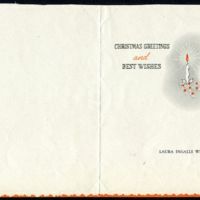 Wilder, Laura Ingalls, “1945 December 29 : Christmas card to Helen Crawford,” Digital Winfield, accessed April 21, 2019, https://winfield.digitalsckls.info/item/7. 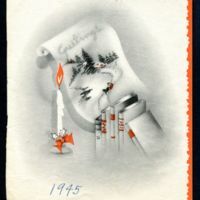 A little late to send Christmas wishes, but in time to wish you a very happy New Year. I am glad to hear from you again and also that my books are still popular. 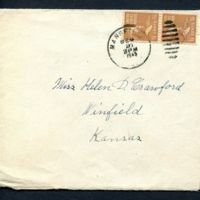 Please give my love to the children of Winfield and Cowley county. Tell them I am wishing them all a very happy New Year.